Arizona State made it to the 1988 College World Series championship game, but Stanford was too much. Sun Devil third baseman John Finn explained why. Finn walked and scored late in that game. He also soon caught the eye of scouts, taken by the Brewers in the 10th round of the next year's draft. Finn went on to a long career as a pro, seeing time in 12 seasons. He made it to AAA in six of those seasons. He never made the majors. Finn's career with the Brewers began in 1989 at single-A Beloit. He hit .299 there, stealing 29 bases. 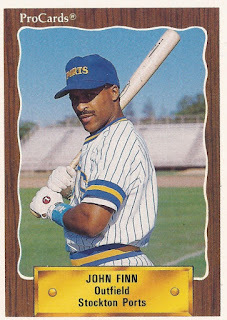 He then moved to single-A Stockton for 1990 and split 1991 between Stockton and AA El Paso. Finn returned to El Paso full time in 1992, swiping 30 bases and hitting .276. He then made AAA New Orleans for the first time in 1993. He stole 27 bases there and hit .281. Finn played in spring training 1994, but he ended on a broken finger. His season was limited to 76 games. He picked up three hits in an August game, two of them doubles. Finn's final season with the Brewers came in 1995, with 35 games at New Orleans. He moved to the Pirates and Cubs AAA teams in 1996, then the White Sox and AA Birmingham in 1997. After returning to AAA with the White Sox in 1998, Finn moved to AA Reading and AAA Scranton and the Phillies organization for 1999. His final pro season came in 1999 with independent Valley of the Western League.